In this weeks reading from Parsahat Chukat (Bamidbar / Numbers 19:1-22:1) the Lord speaks to Moshe about the “red heifer” regarding ritual purity. The entire heifer is burned to ashes, its hide, flesh, blood, and refuse, everything (19:5), including cedar wood, hyssop, and scarlet material which were cast into the midst of the burning heifer. The ashes of the heifer are mixed with water and used for the removal of physical uncleanness (19:8-9). The mitzvot on touching the dead is given and we learn uncleanliness behaves as a transmittable communicable defilement as it is related to dead bodies. It is interesting here that the only thing that can overcome becoming unclean by death is death itself, the ashes of the red heifer. Might this suggest a Torah example of a messianic expectation of the work of the Messiah? The people arrived in the desert in the wilderness of Zin at a place called Kadesh. There was no water and so the people complained. Moshe brings this matter before the Lord and the Lord instructs him to take the staff and “speak to the rock.” Moshe and Aaron take the staff and speak harshly to the people and strike the rock two times disobeying God’s word. These events which describe Moshe and Aaron not honoring the Name of God before the people prevented their entering into the Promised Land. The Torah portion concludes with the record of Israel defeating the kings of Arad and Sihon (21:1). After defeating the kings, the people complain because of the long journey and the Lord sends fiery serpents among them and many people died (21:6). Moshe set up a bronze serpent upon a staff so that everyone who looked upon the serpent would not die if they had been bitten by the serpent. According to the Torah, an molten image was set up by Moshe which is said to have healed those who looked upon it by faith. When the children of Israel were marching southward to go around Edom, they began to grumble against the Lord and against Moshe concerning the manna. As a result, the Lord sent the “fiery serpents” and many died from the poisonous bite. This led to the people’s repentance, and Moshe sought the Lord in prayer about the situation. Moshe was told to make a pole and to lift up an image of the bronze serpent. Those who were bitten were to look upon the image and they would be healed of their sickness (Bamidbar / Numbers 21:4-9). Later on in Israel’s history, the “brazen serpent” became an object of worship to Israel, and remained until Hezekiah destroyed it by breaking it into fragments according to 2 Kings 18:4. According to the biblical account and in general Christian interpretation, the serpent has come to be representative of the Devil, the arch enemy of God, the deceiver, and the one who deceived Adam and Eve in the Garden of Eden. Based on the biblical account of the serpent at the time of the creation, the serpent, according to Judaism, in the Talmud, the serpent stands for such evils as talebearing and defamation of character (Bereshit / Genesis 3:4-5) and a person who practices sin is considered HaSatan (the deceiver). Judaism’s description of the serpent follows the actions that had occurred in the Torah account when the serpent said “did God really say…” The Midrash on Bamidbar / Numbers 21:4-9 finds in the plague of the fiery serpents a punishment for the sins of the evil tongue (Bamidbar / Numbers 21:5). The idea is that God said, “Let the serpent who was the first to offend by the ‘evil tongue’ inflict punishment on those who were guilty of the same sin…” Therefore the people did not profit by the serpents example, rather, they died as a result of the sin of talebearing. The complaint of the people in this case was the dissatisfaction with the food (manna) God had given them. (Also, consider the parallel of the manna, the bread from heaven, the Messiah, and the dissatisfaction of the leaders in the first century period and Yeshua.) The rabbinic homiletic discussions on the manna describe the manna as having any taste desired by the person eating it, as opposed to the serpent were all things had the taste of dust, in accordance with the word of God which states, “And dust shalt you eat all the days of your life” (Bereshit / Genesis 3:14). The rabbinic comparisons comes by those who loathed the food which had been given any taste one desired, being punished by means of the creature to which everything has the same taste (see Midrash Rabbah on Bamidbar 19:22). The Talmud Bavli Rosh Hashana 29a does not take literally the words “Every one who was bitten by a serpent would look at the serpent and live,” but interprets them symbolically to say that the people should look up to the God of heaven, for it is not the serpent that brings to life or puts to death, but it is the Lord God in heaven who has the power to do so (Talmud Bavli Rosh Hashana 29a). Mishnah. [it is written] and it came to pass, when Moses held up his hand that Israel prevailed, etc.now did the hands of Moses wage war or crush the enemy? not so; only the text signifies that so long as Israel turned their thoughts above and subjected their hearts to their father in heaven they prevailed, but otherwise they fell. the same lesson may be taught thus. [it is written], make thee a fiery serpent and set it up on a pole, and it shall come to pass that everyone that is bitten, when he seeth it, shall live. now did the serpent kill or did the serpent keep a live? no; [what it indicates is that] when Israel turned their thoughts above and subjected their hearts to their father in heaven, they were healed, but otherwise they pined away. A similar interpretation is found in Targum Jonathan on these verses from Bamidbar / Numbers saying, “And Mosheh made a serpent of brass, and set it upon a place aloft; and it was, when a serpent had bitten a man, and the serpent of brass was gazed at, and his heart was intent upon the Name of the Word of the Lord, he lived. [JERUSALEM. And Mosheh made a serpent of brass, and set it upon a high place; and it was that when any one had been bitten by a serpent, and his face was uplifted in prayer unto his Father who is in heaven, and he looked upon the brazen serpent, he lived. ]” It wasn’t just the looking at the serpent that healed a man. Salvation and healing comes by reason of having one’s heart intent upon the Lord, seeking the Lord in prayer, and believing the Lord has the power to heal. The one who was lifted up was the facilitator, a person or thing which causes us to draw our thoughts and intentions to the One who had the power to heal, deliver, and save from death, this is the action of faith in the Lord God in heaven. Based upon these rabbinic concepts of having faith in the Lord as opposed to simply looking at the serpent may have been the reason behind Yeshua’s use of this imagery when speaking to Nicodemus in John chapter 3. Note how the narrative in the last few Torah portions has been related to the leadership of Moshe and Aaron and their testimony of God and His commands. Yeshua speaks to Nicodemus in a similar manner, speaking of what he has seen (the miracles) and what he knows (the Torah) and yet he does not believe Yeshua’s testimony. Yeshua again uses the “ascending and descending” rabbinic concept to illustrate his point. According to the Torah, Moshe does not describe what he saw in heaven when he ascended the mountain. He does say that he was shown the image of the tabernacle that he was commanded to construct, however, he does not provide all of the details of what he saw, the Torah is absent of the heavenly descriptions. Yeshua may be taking from this perspective when he said 3:12 ‘If I told you earthly things and you do not believe, how will you believe if I tell you heavenly things? 3:13 ‘No one has ascended into heaven, but He who descended from heaven: the Son of Man. (NASB) saying that he is the one who descended from heaven and he brings with him the testimony of the Father in heaven. He then uses the Scriptures from Parashat Chukat on the serpent that was lifted up, to the one who believes will have eternal life (John 3:14-15) drawing upon the rabbinic understanding that one lifts up his face to gaze upon the serpent in prayer and faith in Father God, and in a similar manner, the son of man will be lifted up, and the one who gazes upon him in prayer and faith in the Lord God will be given eternal life. These concepts are consistent with the rabbinic interpretation from the Mishnah Rosh Hashanah 3:8. “And so it was, when Moshe raised his hand, Israel prevailed…” (Exodus 17:11). And is it Moshe’s hands that make [success in] war or break [success in] war? Rather, [this comes to] tell you, [that] whenever Israel would look upward and subjugate their hearts to their Father in heaven, they would prevail; and if not, they would fall. Similar to this matter, you [can] say concerning the verse; “Make a [graven] snake and place it on a pole, and everyone bitten who sees it will live” (Numbers 21:8): And is it the snake that kills or [is it] the snake that [revives]? Rather, whenever Israel would look upward and subjugate their hearts to their Father in heaven, they would be healed; and if not, they would be harmed. A deaf and dumb person, or a mental retard or a minor, cannot relieve others from their obligation [if they blew the shofar for them]. This is the general rule: all those who are not obligated in something, cannot release [others] from their obligation.והיה כאשר ירים משה ידו וגבר ישראל וגו’ (שמות יז יא). וכי ידיו של משה עושות מלחמה או שוברות מלחמה? אלא לומר לך: כל זמן שהיו ישראל מסתכלים כלפי מעלה ומשעבדין את לבם לאביהם שבשמים – היו מתגברים, ואם לאו – היו נופלין. כיוצא בדבר אתה אומר (במדבר כא ח): עשה לך שרף ושים אתו על נס, והיה כל הנשוך וראה אתו וחי. וכי נחש ממית, או נחש מחיה? אלא בזמן שישראל מסתכלין כלפי מעלה ומשעבדין את ליבם לאביהן שבשמים – היו מתרפאים, ואם לאו – היו נימוקים. חרש שוטה וקטן אין מוציאין את הרבים ידי חובתן. זה הכלל: כל שאינו מחויב בדבר, אינו מוציא את הרבים ידי חובתן. The Mishnah speaks of having faith, Moshe raising his hands in praise to the Lord and having success in war whereby “whenever Israel would look upward and subjugate their hearts to their Father in heaven, they would prevail; and if not, they would fall.” In parallel fashion, Moshe makes the image of the snake lifting it up upon a pole and everyone bitten who sees it will live. The rabbis say, “whenever Israel would look upward and subjugate their hearts to their Father in heaven, they would be healed; and if not, they would be harmed.” The point of harm was to draw one to humility, repentance, and subjugation of heart to our Father in heaven. If humbleness, repentance, and the subjugation of heart to God’s word was so important for healing back then, how much of an influence do you think this has today on being healed in the Messiah Yeshua? In John 3, Yeshua speaks of having faith in God’s Messiah, of being exempt from judgment for those who believe, and being under judgment for those who do not believe. Note the parallel here to the Talmud, Mishnah, and Yeshua’s interpretations. He continues speaking to Nicodemus with the light verse darkness analogy. The rabbinic understanding of the “light verses darkness” illustrations should have caused Nicodemus to immediately put these concepts together while speaking with Yeshua. Based upon the Torah portion, Parashat Beha’alotcha, the light is a reference to God’s directing our lives according to His Word where He makes a distinction in our lives between the light and darkness. The purpose of the mitzvot is to make a distinction in our lives between righteousness and unrighteousness according to the Torah. In addition, the difference between light and darkness may also be understood as a parallel between the knowledge of good and evil. In the light one is able to judge how one walks and to choose the right path to walk in. The Torah has a one-to-one correspondence here to the light, if we are not studying Torah, how would it be possible to choose the right path (the path of righteousness) to walk in? In addition, darkness is used to hide ones actions (the evil ways), to walk in wickedness without others observing what one is doing. Light has also been used to illustrate the choice between following the commandments of God, in His promises, and seeking to join one’s self to the Lord, and to the hope of Israel and His eternal rewards, as opposed to darkness having the meaning to follow the enticing of the devil which persuade man to do evil and become captive to sin, wickedness, and being damned to hell which is described as the hope of the nations, eternal darkness. Yeshua says 3:20 ‘For everyone who does evil hates the Light, and does not come to the Light for fear that his deeds will be exposed. 3:21 ‘But he who practices the truth comes to the Light, so that his deeds may be manifested as having been wrought in God.’ (NASB) This is consistent with the rabbinic understanding of light verse darkness to good deeds (righteousness) verses evil deeds (unrighteousness). 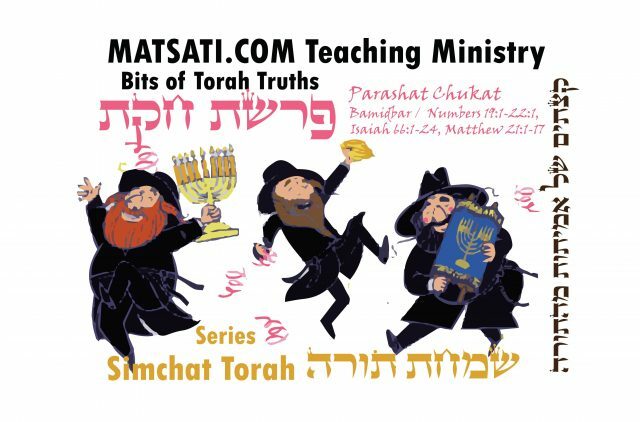 In this week’s Torah portion, the serpent is a symbol of sin and judgment which is coupled with being lifted up from the earth (as being put on a tree), thus drawing in the concept of a curse (Devarim / Deuteronomy 21:23, Galatians 3:13). “God made him who had no sin to be sin for us, so that in him we might become the righteousness of God” (2 Corinthians 5:21). The symbolism here is of those who would look to the one who was lifted up in faith, prayer, and humility, in the Lord God in heaven, and the Lord God would send His redemption and deliverance. Many years later, when the Israelites were in the Promised Land, the serpent became an object of worship (2 Kings 18:4). The people eventually took the things of God and twist them into idolatry. This was the point of the Torah commands to not make graven images. The command against idolatry was designed to prevent that tools (objects) from becoming objects of worship. All the honor and glory belong to the Lord God alone, and not to the wafer, the wine, or other object used in the service to the Lord. 12:32 “And I, if I be lifted up from the earth, will draw all men unto me.” 32κἀγὼ ἐὰν ὑψωθῶ ἐκ τῆς γῆς, πάντας ἑλκύσω πρὸς ἐμαυτόν. Note that the word “men” is not in the original Greek text, the word used is πάντας meaning “1) individually 1a) each, every, any, all, the whole, everyone, all things, everything 2) collectively 2a) some of all types.” The description here is the drawing of something of all types of individuals. In a similar thought, Yeshua also said that the Father in heaven draws men to him in John 6:44-45. 6:44 ‘No one can come to Me unless the Father who sent Me draws him; and I will raise him up on the last day. 6:45 ‘It is written in the prophets, ‘And they shall all be taught of God.’ Everyone who has heard and learned from the Father, comes to Me. (NASB) 44οὐδεὶς δύναται ἐλθεῖν πρός με ἐὰν μὴ ὁ πατὴρ ὁ πέμψας με ἑλκύσῃ αὐτόν, κἀγὼ ἀναστήσω αὐτὸν ἐν τῇ ἐσχάτῃ ἡμέρᾳ. 45ἔστιν γεγραμμένον ἐν τοῖς προφήταις, Καὶ ἔσονται πάντες διδακτοὶ θεοῦ: πᾶς ὁ ἀκούσας παρὰ τοῦ πατρὸς καὶ μαθὼν ἔρχεται πρὸς ἐμέ. What we are finding here in this week’s Torah portion is that God’s plan for us is larger than a person simply going to church, believing in Jesus, and worshiping Him, and that being the extent of our relationship with God. Yeshua says that He will draw “all,” and thus, He is saying that his death and resurrection has the power to draw all men to repentance, to turning from sin and to eradicate sin. The Scriptural description of the eradication of sin is the same as saying the eradication of disobedience, which is synonymous to saying that He will cause His people to walk in righteousness and holiness. The point is that salvation and healing comes by reason of having one’s heart intent upon the Lord, seeking the Lord in prayer, humbling our hearts, performing Teshuvah, and believing the Lord has the power to heal. This is coupled with the desire to make a distinction in our lives between righteousness and unrighteousness, and making the choice to do what is right and just and true. If we are not seeking righteousness, holiness, and truth in our lives, is it right to expect the Lord to heal us? Previous articleTehillim / Psalms 96, ספר תהילים צו, Part 1, Does the Existence of Idol gods suggest they are real? Next articleTehillim / Psalms 96, ספר תהילים צו, Part 2, Does the Existence of Idol gods suggest they are real?